The University of Utah men’s tennis team will begin play tomorrow, Thursday, October 9 in the Utah Intercollegiate Tournament. The Utes will compete against players from Utah State and BYU. The tournament will be played at Coach Mike’s Tennis Academy (weather permitting) in Salt Lake City, Utah and will run through Saturday. All first and second round singles matches will be played on Thursday and the first round of doubles will be played on Thursday. Senior and vice-captain Cedric Willems (Utah) is the No. 2 seed in Flight A. Willems has a bye in the first round and will play Marcus Fritz (Utah State) in the quarterfinals at 11:30 a.m. 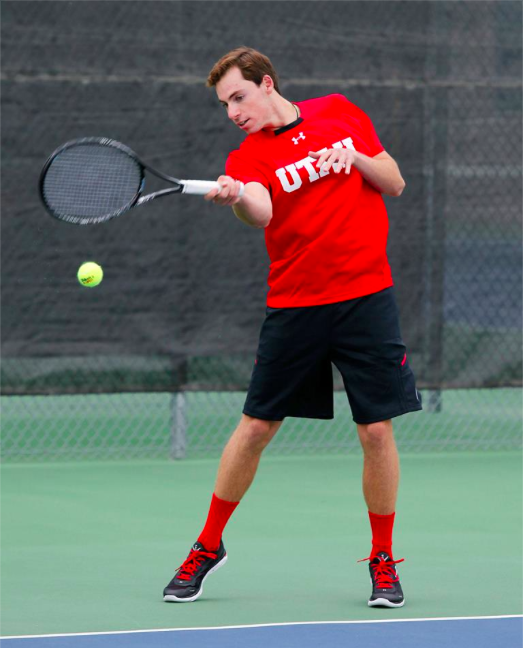 Junior Matt Cowley (Utah) is slated to face Juan Canales (BYU) in the first round at 10 a.m. Freshman Santiago Sierra (Utah) rounds out the Utes’ representation in Flight A, and he will play at 10 a.m. versus Karan Salwan (Utah State) in the first round. Junior Jamey Swiggart (Utah) is seeded No. 3 in Flight B. He has a bye in the first round and will play the winner of the match between teammate Louis-Phillipe Gascon (Utah) and David Ball (BYU). Gascon and Ball’s match will begin at 10 a.m. The next round is scheduled to begin shortly after at 12:30 p.m. Junior Justin Archer (Utah) will take on Jaime Barajas (Utah State) in the first round at 10 a.m. Freshman Johan Jonhagen (Utah) is final Ute in Flight B. He will contest Andrew Nakajima (Utah State) at 10 a.m.
Willems/Swiggart (Utah) are the No. 2 seed and have a bye in the first round. They will face Cosmai/Nakajima (Utah State) on Friday at 9 a.m. Gacson/Jonhagen (Utah) are slated against Canales/Bourgeouis (BYU) in the first round on Thursday at 9 a.m. Cowley/Sierra (Utah) have a bye in the first round and will play No. 4 seed Salwan/Swindells (Utah State) on Friday at 9 am. Come to Coach Mike’s Tennis Academy to support the Utes or check this website and our social media sites for updates. Click here for the full draw sheets. This entry was posted in Schedule/Results and tagged BYU, Cedric Willems, Jamey Swiggart, Johan Jonhagen, Justin Archer, Louis-Philippe Gascon, Matt Cowley, Santiago Sierra, Utah Intercollegiate Tournament, Utah State, Utah Tennis, Utah Utes. Bookmark the permalink.